I am very excited to share my latest ‘make’ with you! 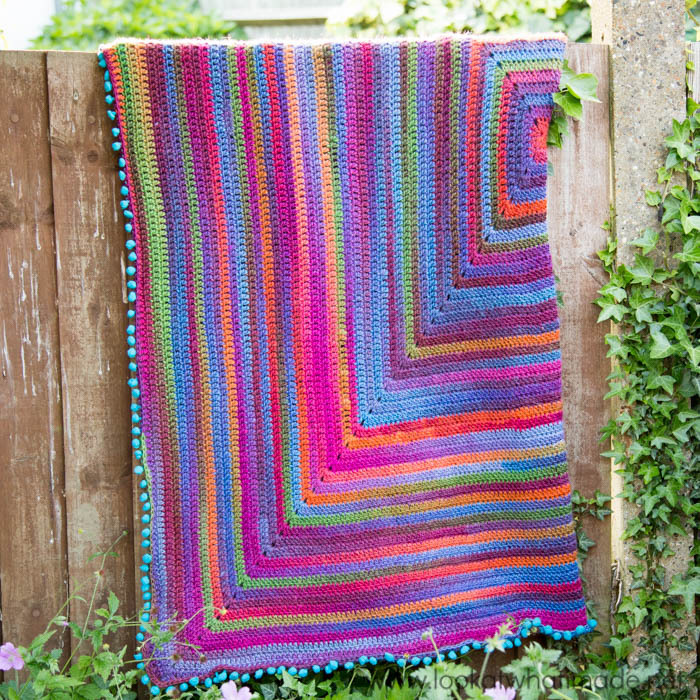 Joy’s Journey is a continuous square blanket with a fun, tactile pompom edging. The blanket was specifically designed for people with Alzheimer’s or Dementia and is dedicated to Jenny’s mom Joyce (Joy), who suffered from Dementia. 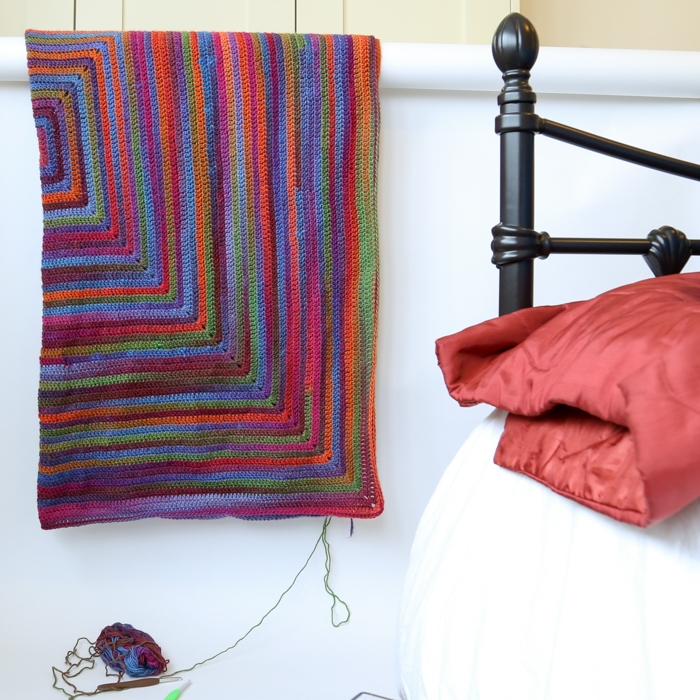 The blanket is made with Scheepjes Noorse Sokkenwol (968), which has become one of my favourite yarns! Although the yarn is listed as a double knit yarn (#3), it works up more like a worsted weight yarn (#4) and is fluffy enough to use with a 6 mm hook (provided you crochet tightly). If you are a relaxed crocheter, you probably want to drop down to a 5.5 mm hook. The colours are rich and autumnal, and the colour changes in the yarn make this pattern very addictive. They also lend interest to a blanket that would otherwise be mind-numbing in its simplicity. 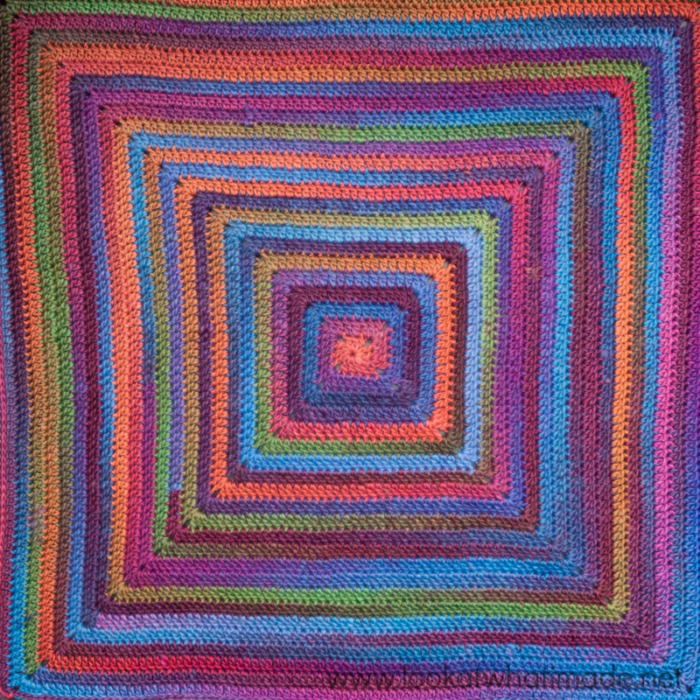 I enjoyed making Joy’s Journey so much that I think I will always have one of these to work on for those ‘just-relax-and-crochet’ moments. It is impossible to describe just how soothing the combination of simple stitches and colour changes actually is. 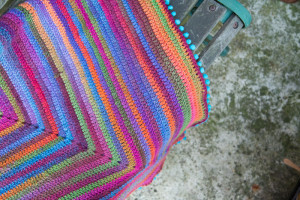 There are no colour changes, because using a colour-change yarn takes care of that for you. 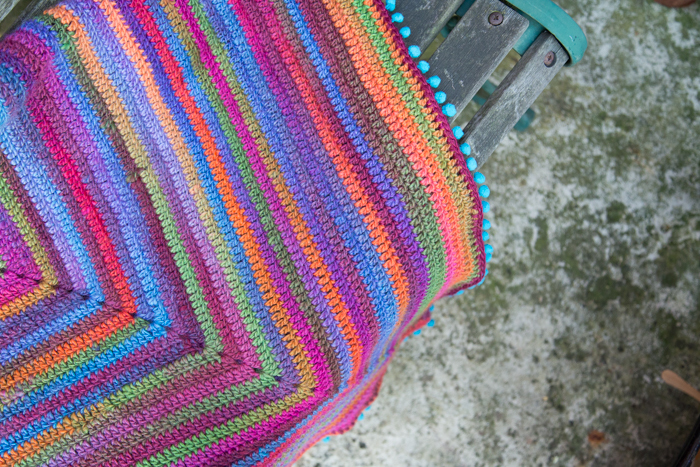 There is no need to join at the end of each round, because the blanket is worked in a spiral using simple dc stitches (US Terms). 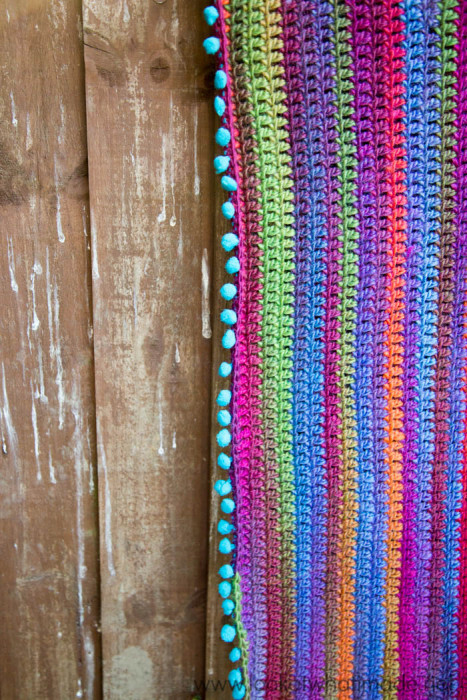 I think it might even be easier than making a continuous granny square blanket! I really wanted Joy’s Journey to be tactile as well as colourful (because I know that people who suffer from Dementia and Alzheimer’s often pick at their clothes and blankets), so I have added a pompom border to mine using pompom ribbon. I wasn’t at all sure that I would like the outcome, but I love it so much that I have decided to add it to the smaller version I made in October last year. I will never again doubt the power of the pompom!! 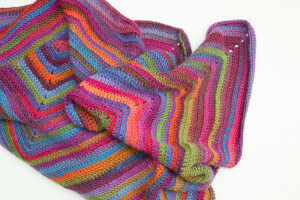 I will be posting the pattern for Joy’s Journey here on my blog next week. In the meantime, you can buy the colour packs for the Baby* and Large* sizes HERE in my Wool Warehouse Shop. Both packs include enough yarn and pompom ribbon to create the specified size, as well as a printed version of the pattern. Instructions have been provided for making the blanket with and without the pompom edging. *The baby blanket is suitable for a Preemie/Car Seat blanket (63 cm/25″ squared) and the large blanket is suitable for a lapghan or throw (130 cm/51″ squared). The baby pack is perfect if you just want to explore how this wonderful yarn works up without committing to buying 12 skeins. If you want to practise making a continuous crochet square, you can find the tutorial HERE. Feel free to share your progress using #joysjourneycrochet and #lookatwhatimadedotnet on social media. 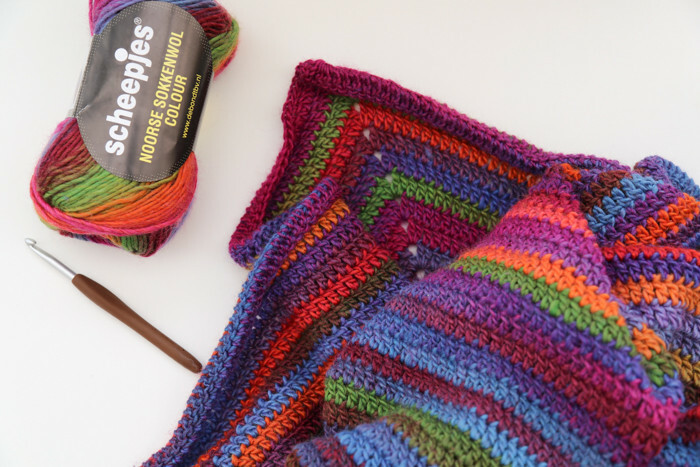 If you are using Scheepjes yarn, you can add #scheepjes as well. And don’t forget to pop back next week for the pattern! What do you mean by “hidden stitch” in the note about blanket getting wavy/ruffling? You skipped about every 5 rows? Finishing the edges with pompom yarn is a terrific idea. Thanks for sharing and inspiring. I love the idea of adding the pom pom edging. I bought about 5 large rolls of the pom pom edging at a clearance sale and had no idea what to use it on. This is fantastic! 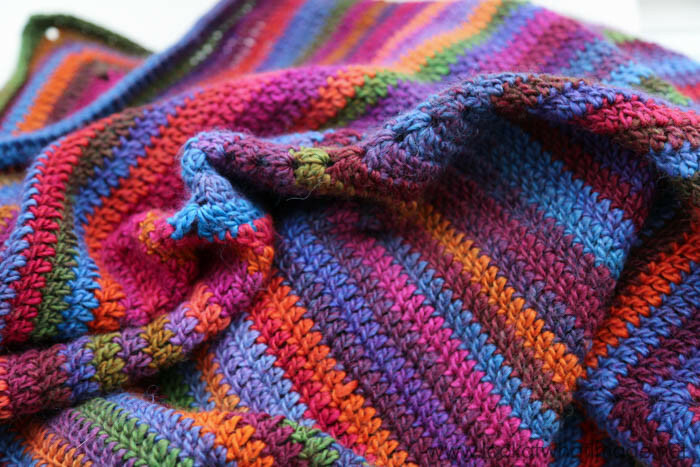 How do you add the edging to a blanket? I didn’t see that step in the instruction link. Hi Vanessa. If you take a look at the actual pattern for Joy’s Journey, you will see how I added the edging. It’s very easy and I am def going to use it more often. Love the colours. Have been thinking about doing the sophie’s universe. Looks beautiful I’m glad that they are video to help. Would using Stylecraft Special D K be alright to do the large one? What hook size would recommend? Waiting for sophie’s book. Hi Anne. Stylecraft Special is a double knit weight, so using it would give you the same dimensions as my medium blanket, not the large one. if you want a larger size, you will need to go with a worsted weight or aran yarn. Very nice! I remember waaaaay back in the olden days (late 1970’s) when I learned to do the granny square, and the person that taught me, only taught me how to go round, not how to start it. So for the first 20 something years I made granny squares, they were continuous. I eventually saw the error of my ways through other patterns. This is really lovely! I wish that yarn was one I could just go out and buy, it is very pretty. Thank you, Maxine. I didn’t realize that. Would you tell me about it when next we meet up? have a great day!